Terrorist publicizes video praising attacks on Jews, wishing his family farewell. 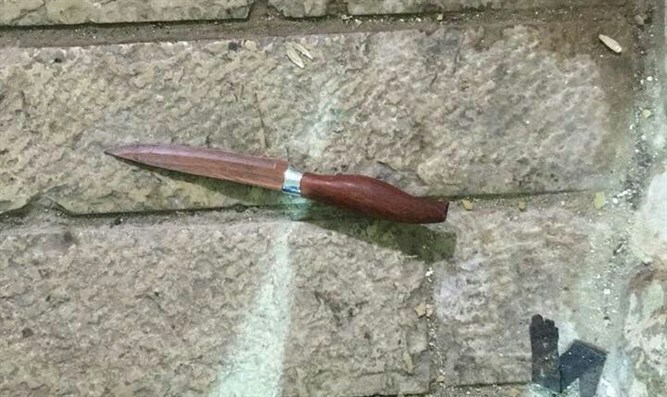 The Central District Prosecutor's Office submitted an indictment against 21-year-old terrorist Alaa Abu-Sanav on Monday for planning to murder Israelis and illegally crossing into pre-1967 Israel. The terrorist uploaded to his Facebook page a video titled "May your morning be perfumed with the scene of shahids." In the video, the terrorist said his goodbyes to his family and friends, and praised previous martyrs. He also said he was "leaving to Israel to carry out an 'act' and may not return. Those close to the terrorist responded, "May God accept you[r sacrifice]." The terrorist then sold his cellular phone for 400 shekels ($114) and paid a professional to smuggle him into pre-1967 Israel. He reached the city of Netanya at approximately 5:00 p.m. and walked around a few hours in search of an appropriate victim. An alert Israel Police officer noticed the terrorist walking and asked him what his business was, but the terrorist did not respond, instead pulling out a green identity card. Suspecting that the Arab was an infiltrator, the officers arrested him. A search of the suspect's body revealed a knife. Israeli citizens, including in Judea and Samaria, have blue identity cards. Green identity cards are for Arabs who live in towns controlled by the Palestinian Authority.